About 10 years ago, I began hearing about the German ESM “Busatis bidux” cutterbar sold by I & J Mfg. It seemed that everyone was impressed by the double acting sickle bar and I couldn’t help wondering if it would improve the mowing action of my ground drive mower in my soggy, fine-but-wiry summer grass. I also had a lot of plugging from late first cutting because of the slimy dead grass that develops in cool wet springs. When Amish first moved to my area, several brought motorized discbines to combat the grass. These worked well enough but they cut into the soft fields leaving extra ruts because of the weight. A few brought motorized I & J double acting sickle bars and seemed to do very well with them. I occasionally watched them in nearby fields. 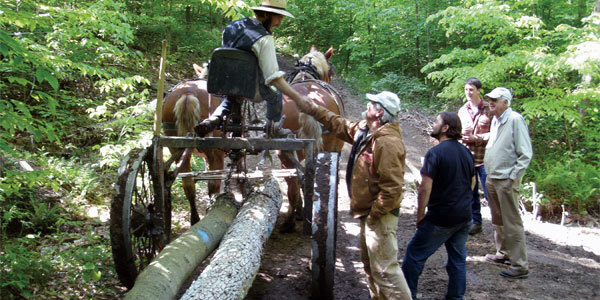 When I attended a draft horse workshop near Amherst, Massachusetts, Jake himself demonstrated one of his ground drive forecarts and an ESM sicklebar mower. It blew me away. It was so quiet! It cut so cleanly! It was so sturdy and so elegantly simple! I wanted one! When I began experimenting with mini horses I found that mowing was the biggest challenge. The machine was heavy to begin with, and when engaged was impossible to pull with 3 minis. I trimmed the cutterbar from 40 to 30 inches and that helped, but after several attempts it became clear that I needed a 24 inch cutterbar or I had to switch to engine drive. I am not opposed to engines, but I remain enamored with ground drive implements. So I began looking at more efficient options. The long upper spring is from a junked mower and floats the drive end of the cutterbar via the triangular linkage and assorted chains. The short spring maintains belt tension. It came off of a high tensile fence. All the online information claimed that the double acting cutterbars require less power to operate. Some claims state that the ESM bidux uses only 1/3 of the power! That made my eyes sparkle! 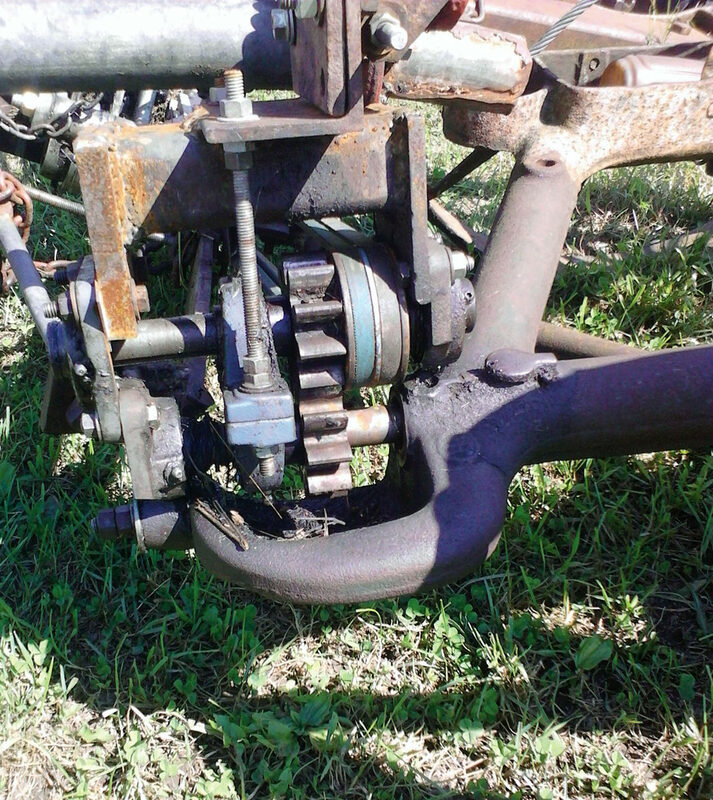 I began pricing parts to adapt a one horse mower over to the ESM system. The parts cost quickly crossed the $3,000 threshhold. That was almost half the cost of a complete ground drive mower from I & J at the time! Eventually I scraped up the cash for the parts and got them home. Designing an adapter frame took me several tries. I wanted the inside cutterbar shoe lined up with the right wheel of the mower because the ESM drive head is very heavy compared to the original sickle bar system. I also wanted to be able to restore the machine to original if my idea did not work. (I make all my modifications reversible if possible.) Finally, the drive belts had to line up with the modified pitman shaft which drove the pulleys. The mounting frame bolts on to the original attachment points on the mower. It is good enough that I have yet to find a reason to tinker with it. The chains are my quick and dirty linkages for the draft compensator, knife tilt and lift/float. I built a triangular cutterbar mount that bolts to the mower frame. It attaches to the drag bar bolt right in front of the pitman shaft and to the brace or push bar in front of the right wheel. I added a float spring and a belt tensioner to complete the upgrade. I had an Amish machinist make a new pitman shaft and mounted a collar lock double pulley to that. I used a pulley the same diameter as the ESM drive head pulley reasoning that a 1:1 ratio would work since the correct number of strokes per foot of forward travel had already been worked out by the engineers when they designed the mower. The ESM cutter bar was a bit over 5 feet long when it arrived. I am optimistic but knew that 5 feet was way to much for 3 minis. I cut it to 40 inches hoping it would be enough. Later trials convinced me that it was a good length for 3 minis if the mower was on level ground. Any uphill at all was too much for the team of 3 so I shortened it another 6 inches and that was good enough. I hated cutting that bar way down. It was a lot of money to hack apart. So I saved the pieces. When I switched back to Haflingers I lengthened the bar out to 4 feet by welding the pieces back together. It works fine on my one horse mower chassis with a pair. The needle bearing I purchased to fit the lower end of the pitman shaft. It replaces the brass bushing that formerly guided the output end of the shaft. One thing that concerned me was the tension of the belt pulling sideways against the brass pitman bushing. I did not want to wear the bushing out and have the pitman shaft run crooked in its casting and misalign the pitman gear to the crown gear in the gearbox. I measured the inside diameter of the casting and the outside diameter of the pitman shaft and ordered a needle bearing that almost fit the close spacing of the two. 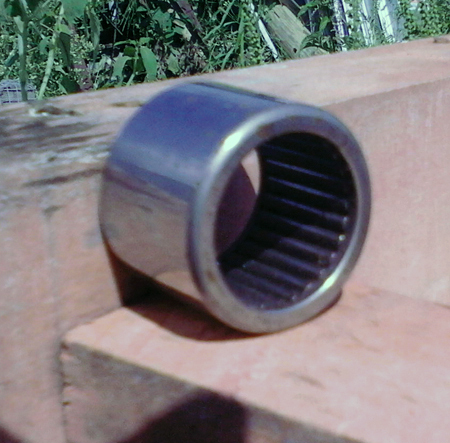 I used a small shim to adjust for the slight play between the casting and the outside of the bearing. It proved to be a good idea so I added another bearing to the first to lengthen the load area on the pitman shaft. As a bonus, I can lubricate the bearings from the original oil holes of the pitman casing. To test the mower I jacked up a wheel and turned it to be sure that everything rotated freely when engaged before an actual field trial. Satisfied that it was all working, I hooked a team and tried it out on the lawn. Within a few feet things went awry. The driven pulley on the mower drive head unscrewed when we cut into some thick grass. I did not realize that the drive head pulley shaft was threaded and could only turn one direction! This is the noisy gear reverser I built to make the drive head rotate the right direction. A drip oiler would quiet it down significantly. I headed back to the shop and twisted the belts to reverse the rotation of the drive head. I had to adjust several other parts too. About an hour later I had everything ready and to my immense relief (my wife was watching) the $3,000 upgrade was working. I loved it immediately. The grass fell quietly, vibration was almost eliminated and the cut was clean. It cut through the crop already down and did not bog of its own accord. 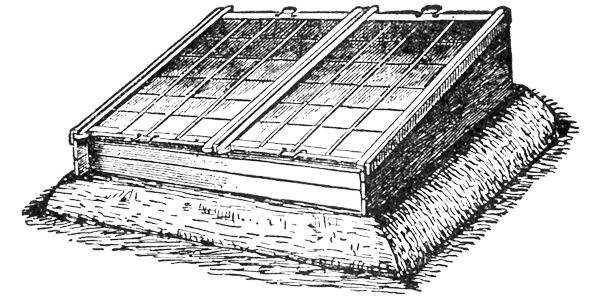 Because of the crossed belts, it would stall out when the inner shoe rode over a hump and reduced the belt tension. Because of that one thing, the cutter bar stalled on uneven ground, I built a gear reverser at the pitman end of the belt. It is everything I did not want to add to my mower because it is loud and complicated. Plus I think it robs power from the system. However it cured the stalling problem. Sideview of complete drive system. I have used this mower for two seasons now. 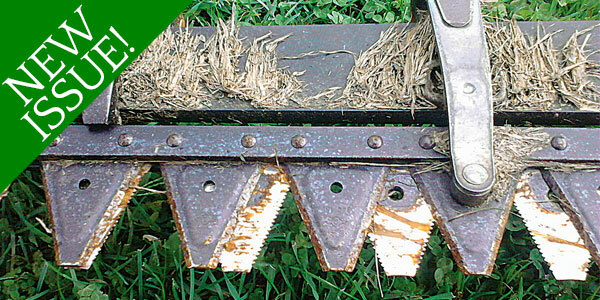 I am delighted with how it cuts wet or dry, fine or coarse, standing or slightly lodged grass. The only thing that I had to learn was sharpening. 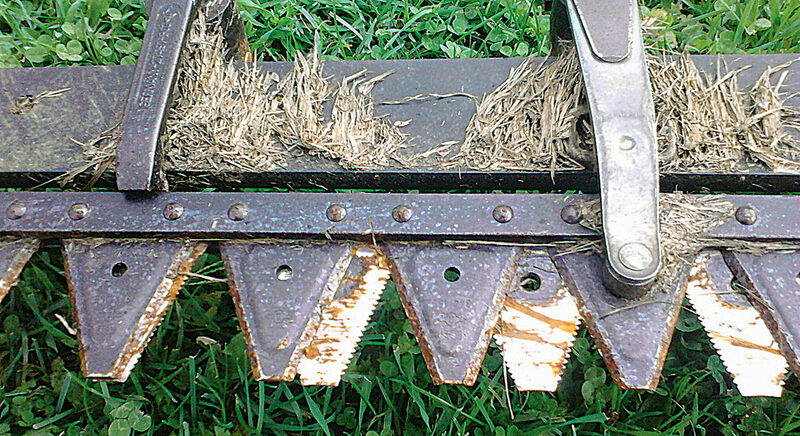 I had never sharpened a mower before because I always used top serrated sections on my mowers. Pulling the top sickle bar is easy and sharpening is quick since the sections are spaced out and only a light lick with a flap wheel or fine grinding wheel on my angle grinder will bring them up to standard. 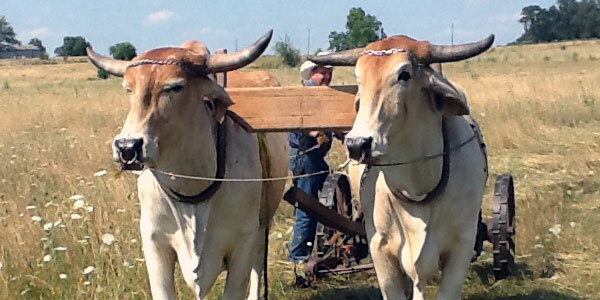 Several of my Amish neighbors warned me that it needed to be sharpened often to avoid ragged cutting. 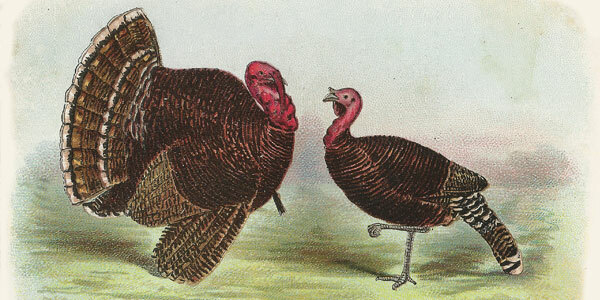 They proved to be correct, and I am grateful for their input. The sting of the original purchase price has worn off. I now consider the addition of the ESM cutterbar to my mower a good investment. I like how it functions and I like all the grease fittings. (I always feel better with a bit of grease or oil oozing out of a bearing) The original claim of reduced power consumption is hard for me to quantify. I have spoken to several people who have purchased a complete ground drive I & J mower and there are mixed opinions as to how it draws when in thick crops. One guy told me, “Well, my mules still blow pretty hard at the end of the field…”, so I can’t really say one way or the other. The upper and lower knives have different sickle spacings that cut in succession distributing the load over more of the cutting stroke. 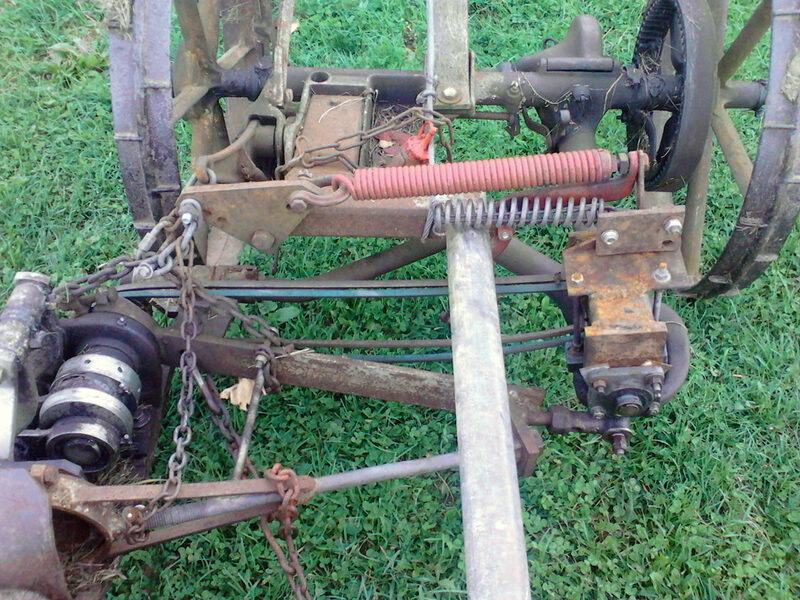 Converting a #9 mower (which has the pitman shaft rotating the right direction) would be a possible option. When seated on a mower, the pitman must spin top to the right (clockwise). I have heard second or third hand that someone has conversion kits available but cannot confirm that. It may be a pleasant challenge to fabricate an adapter for an ESM sickle bar during the winter months, but be prepared for the expense. 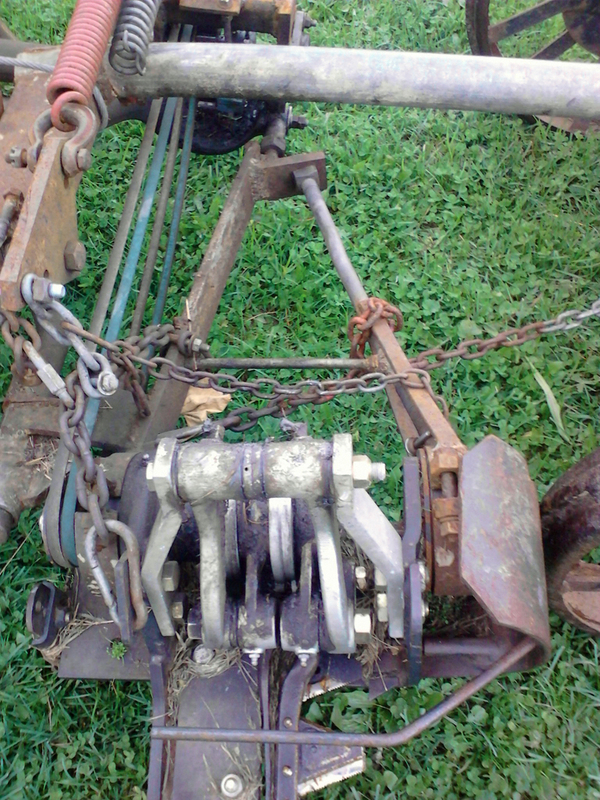 I consider it essential to include a float spring to reduce the drag of the sickle bar against the ground when mowing. I also think using a roller bearing in place of the pitman bushing is important if the mower does not have bottom end bearings on the pitman shaft. Finally, don’t be afraid of belts. I have never had grass wrap on the pulleys no matter how tall or short. I strongly suggest adding a drive belt tensioner to prevent stalling the cutterbar on uneven ground. The entire mower in all its glory. My winter plan is to build some sort of belt drive from start to finish to eliminate gears altogether. I want to hear the grass fall, not gears growl. I also hope to clean up the float spring assembly. I have tried to develop some sort of gag lift so that the cutterbar lifts parallel to the ground like my original did, but that is still mostly between my ears. After all the tinkering with my machine I am still ahead several thousand dollars. 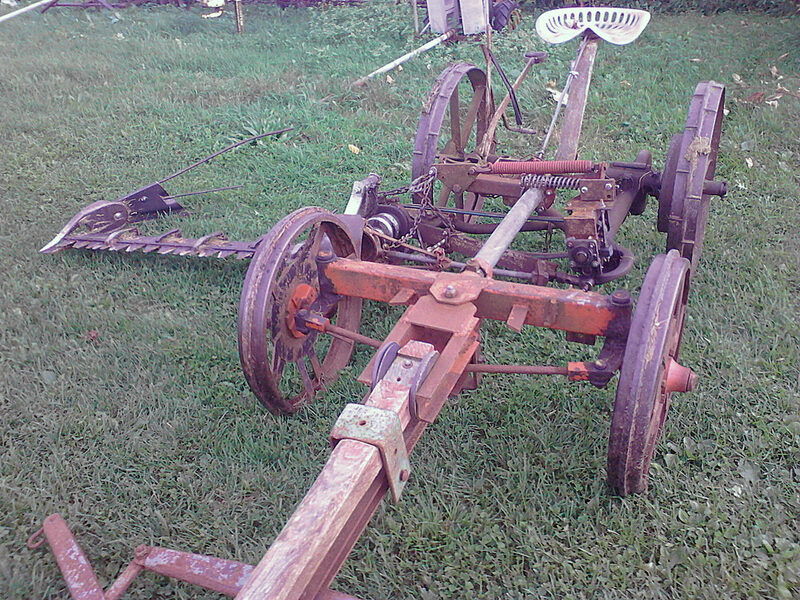 I used a one horse mower as the base unit, had a lot of scrounge parts and metal and more time than money. The ESM sicklebar is a pleasure to operate and does a good job under variable conditions in the field. I now have a local dealer for parts and I am confident that it will last for many seasons with minimal down time. Finally, I have to give credit where it is due. 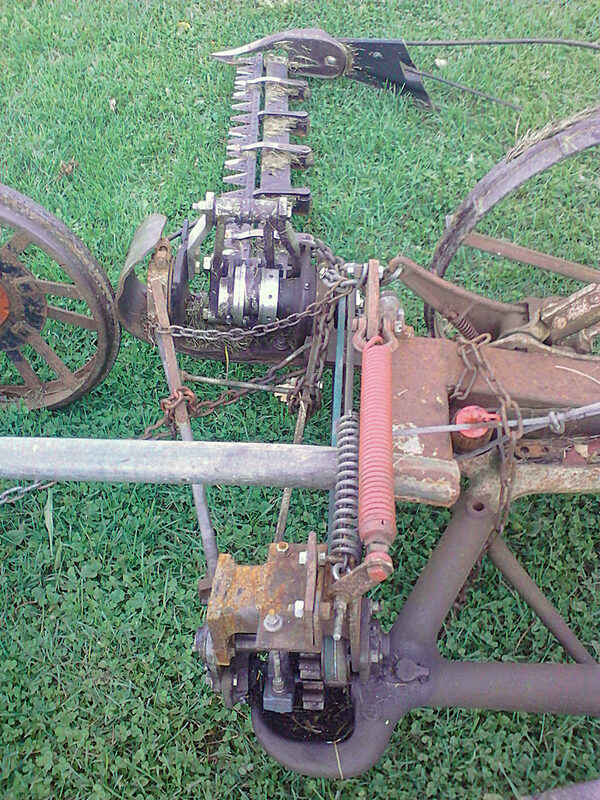 Somewhere, in all my SFJ publications, is a photo of a European mower with a belt drive double action sicklebar mounted on an older ground drive chassis. That was my initial inspiration for this project. 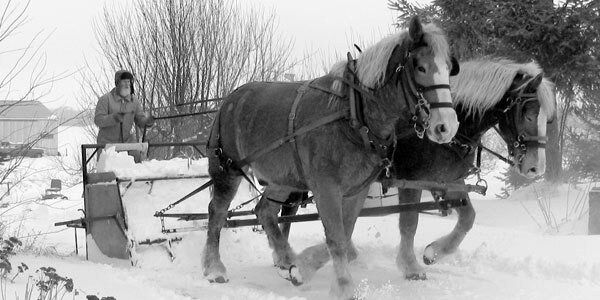 Just as with horses and newer implements, the marriage of proven older technology and newer advanced inventions can lead us toward a more efficient machine that benefits the horses with a more comfortable load and the teamster with a better end result for the investment. And I must say that I really enjoy what the other tinkerers bring to the table as we push toward a better future in the SFJ family and other circles. I believe our fertile imaginations are leading to a more fertile tomorrow.